Deep sea fish species found in the north Pacific Ocean have mysteriously been caught in the southwest Atlantic, on the other side of the world. It is unclear how the animals, a giant rattail grenadier, pelagic eelpout and deep sea squid, travelled so far. Their discovery 15,000km from their usual home raises the possibility that deep sea currents can transport animals from one polar region to another. Details are published in the journal Deep Sea Research part I. "These findings were completely unexpected," says Dr Alexander Arkhipkin of the Falkland Islands Fisheries Department, based in Stanley, on the Falkland Islands in the southwest Atlantic Ocean. Since 1987, the Falkland Islands Fisheries Department has performed surveys of fish caught by commercial and research fishing trawlers travelling above the Patagonian Shelf and slope around the islands. Commercial longline catches of Patagonian toothfish have also been examined. Recently, these catches have brought to the surface animals previously unknown in the southwest Atlantic. For example, Dr Arkhipkin and colleagues Dr Vladimir Laptikhovsky and Dr Paul Brickle report a 81cm-long grenadier fish belonging to the genus Albatrossia caught by the longline fishery set to catch Patagonian toothfish. Another deepwater trawl caught a small 15cm-long pelagic eelpout at a depth of 1000m. Experts have identified this fish as being a member of the slipskin species Lycodapus endemoscotus. Previously both species were only known from the deepwaters of the north Pacific Ocean. A small immature 11cm-long north Pacific gonate squid Gonatopsis octopedatus was also recovered from a trawl south of the Falkland Islands. 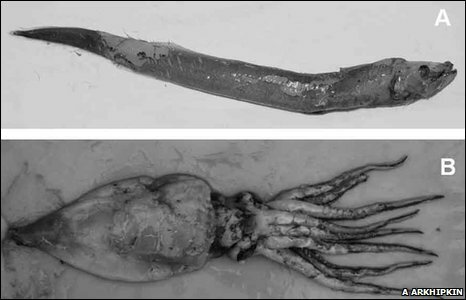 Genetic analyses confirmed the identification, which is the first time any member of this squid genus has been recorded in the southern hemisphere. The catches are the first time that such deepwater species have been caught so far from their natural habitat. All three species habitually live in the deep waters of the north Pacific, at depths greater than 600-1000m. That makes it extremely unlikely that the fish and squid could have become trapped in ballast water used by ships, and transported around the world. "We would not expect that relatively slow deepwater fish and squid might travel so far from their common habitats," says Dr Arkhipkin. All three species live above the seafloor, and none of the three are known to habitually migrate, just as tuna and whales do. Far more likely is that each animal was transported thousands of kilometres by deepwater currents. These flow south, across the equator, moving past South America underneath another northbound flow called the Humboldt Current. 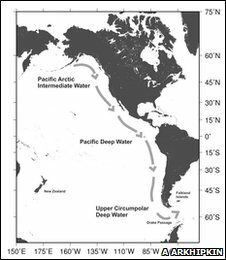 Finally, this flow mixes with another called the Upper Circumpolar Deep Water to pass through the Drake Passage, whcih separates South America and Antarctica, to the Southwest Atlantic. Such deep water currents flow slowly, so it may take a few years for a long-lived fish, or even several generations of short-lived fish or squid to migrate the whole way. Dr Arkhipkin says the catches may force scientists to reevaluate their ideas about the distribution and movements of deepwater species. Though there is no evidence to support the idea, Dr Arkhipkin speculates that climate change may be influencing the deepwater currents, facilitating the novel spread of such animals.